From my recent experiences with my new Apple Watch, I learned some key things to do right before and right after getting your shiny new toy. Now that Apple is selling the Apple Watch in retail stores, more people are getting them. From my recent experiences with my new watch, I learned some key things to do right before and right after getting your shiny new toy. Here are a few tips to follow before getting started with your Apple Watch. Some people get lazy and don’t do system updates. The reasons vary — perhaps it’s because you like to keep your phone packed with music and apps and just don’t have enough space to perform an upgrade. Or perhaps you just don’t have time and can’t risk an upgrade causing issues with your mobile. To use the Apple Watch, however, your iPhone needs iOS 8.3 or later. You’ll also want to update all your apps since some of them have been updated to support Apple’s new Watch and include many new functions. After you run those updates, remove the programs you were just testing or just no longer use. For example, I have all the major airline apps, but I have no upcoming flights. I don’t need those on my phone. When your Apple Watch pairs, it connects with your apps. The fewer apps you have on your phone, the quicker the initial setup. When the prompt came up on my watch to Install Available Apps, I picked Install Later. The Apple Watch didn’t listen and tried to install them anyway. After going through this initial setup myself, I’d suggest blowing away the apps you don’t need and selecting Install All. What’s the fun of having a stripped down Apple Watch? Just like a computer, phones get wonky. I have a dozen or so paired Bluetooth devices and my phone gets confused. Rebooting right before pairing makes sure your phone isn’t heading for a crash and just might keep you from getting frustrated with your new watch. “Dave’s Watch” sounds so boring. If this is a personal device, I want to set the name. In the Apple Watch app, tap General > About > Name. You can see what I named mine (apologies to Captain Jack Harkness). Notice how the icons move around as you try to find them. It’s a cat-and-mouse game I find annoying. Go to General > Accessibility and then toggle Reduce Motion to On. Now your apps are easier to locate on the Watch — at least in my opinion. While you’re in that screen, check out some of the other options. My middle-aged eyes need bold text and a reduction in transparency. I love the fact I don’t have to pull my phone out of my pocket to read a notification. However, if I’m driving, I don’t even want to turn my wrist. In the Accessibility preferences, scroll down to the Accessibility Shortcut and select VoiceOver. When you triple-click the digital crown, your Watch will read to you what’s on the screen. Triple-click again to turn it off. Great for driving or when I’m working out with Bluetooth headphones. Now is the time you really get to play. Scroll through your apps and figure out what you want on the phone. Each app that works on your phone can have an app and a potential glance. Until the market matures, Watch app quality and functionality don’t parallel the iPhone. I love 1Password but I don’t use the Apple Watch app. All that app does is let me pick a list of passwords to have on my Watch. Yawn. The Starbucks app has everything I need on the Watch. 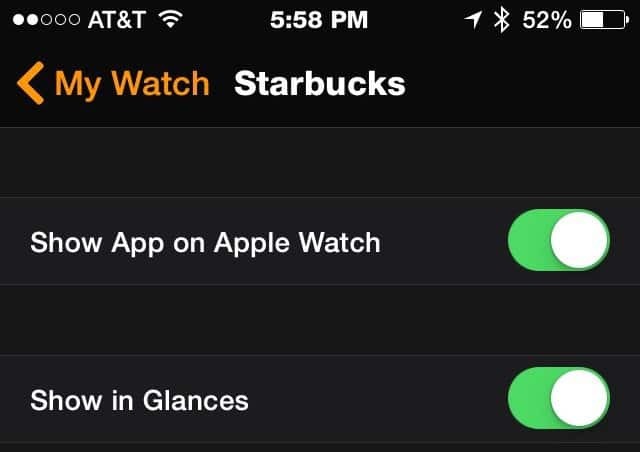 The Watch app finds the closest Starbucks and its hours. If I tap on the location, it then takes me to the map app. Best of all, I can access my Starbucks registered credit card although I can’t pay with the Starbucks app (they put that in Passbook). I was never a big fan of Passbook. It would too often try to guess what I wanted and annoyed me. When I was at a shopping plaza with stores close together, it always brought up the wrong location. On a practical level, if I’m pulling out my phone, how much harder is it to pull out my wallet? The Passbook on the Apple Watch is different. I’d rather twist my wrist and maybe swipe to a different card than pull out my phone or wallet. For the same reasons, I didn’t add my credit cards to my iPhone. With the Apple Watch, having this information on my wrist makes more sense. 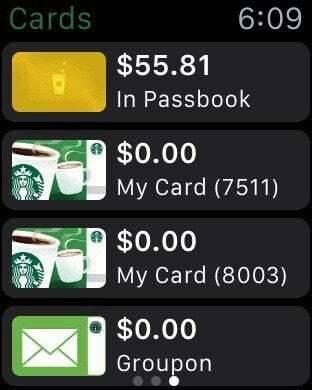 The Starbuck’s Watch App doesn’t give you a scannable gift card, but adding it to Passbook does. Since you don’t have a keyboard, you can’t type a reply to Messages from the Apple Watch. Within the Apple Watch app on your iPhone, you can change the standard message responses. Head over to Messages and tap Default Replies. 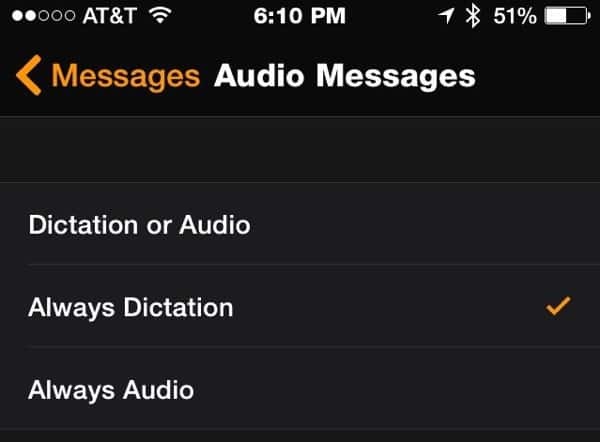 While you’re there I set the Audio Messages to Always Dictation. That way you won’t worry about sending audio messages to people (Who does that?). That’s a starting guide for your Apple Watch. Go have some fun with it! ​After some time spent with my Apple Watch I can finally say that this device deserves its place on the wrist. What caused my decision is the nice little third party apps that make life easier and give some added value. Take Idealist shopping list (http://www.idealistshopping.com) for example. This nice little app now lets me use both my hand while I do the shopping and still see the products I need to buy. I no longer have to hold my iPhone to check the list. So look for these nice little apps and you will see the power of the watch. I’m Chris, and I work for AgileBits, makers of 1Password. I saw your mention about 1Password for Apple Watch, and I just wanted to share my thoughts after using 1Password on my own Watch. When we designed 1Password for Apple Watch we approached it with the idea that you’d store only a few things on it that would be useful to look up on your wrist, instead of having to dig out your phone. And many of these ideas went beyond passwords alone. For me, one of the biggest things for me on 1Password for Apple Watch is secure note containing the shut down and lockup procedures for a facility a group I belong to uses. It has what the thermostats need to be set at, which lights need to be left on, and how to arm the security system. While I could look it up on my phone, it is super convenient to just do a couple taps on my wrist and then be able to glance at it as I make my rounds through the building. Also, since I am an infrequent traveller, it’s handy to have my combination for my suitcase’s lock in there so I can quickly find it to jog my memory. Those are just a couple ways I use 1Password for Apple Watch, one that’s a bit elaborate, and one more conventional. Is there anything that you think would be a great fit for 1Password on Apple Watch? If so, we’d love to hear about it. Email support+social@agilebits.com, and we’ll talk.